A great way of testing a new search engine is to compare it to the dominant established search engine. 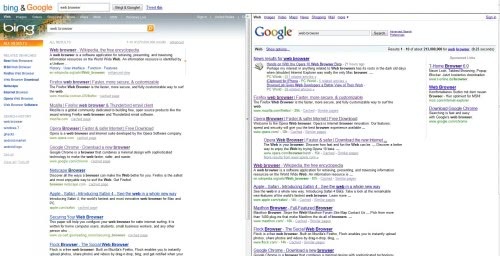 BingAndGoogle offers a combined search interface that is more comfortable than working with two web browser windows or switching between tabs in the same window. The search engine mashup displays a single search form on the main page. It will perform searches on both Bing and Google and display the results in two columns on the same page with the Microsoft Bing search engine on the left and the Google search engine on the right. This makes it easier to work with both search engines and compare results in the same window. The service displays its search form on the top of the screen so that users can perform additional searches on both search engines right away. It is furthermore possible to use a search form in one of the columns to search in one search engine exclusively. The search for web browser that is shown in the image above shows that both search engines list Firefox, Opera, Google Chrome (Google Browser), Safari and Flock on the main page. Google links to the Maxthon web browser additionally while Microsoft to the defunct Netscape browser. Funny though that both are not linking to Internet Explorer on their first results page. Both columns offer the full functionality offered by the search engine including image and video search. Bing And Google offers an easy to use mashup that delivers results from both Bing and Google making it extremely convenient to work with and compare both search engines. Update: The latest version of the web service lets you search not only on the U.S. Google and Bing search engines, but also on localized search engines for the U.K, Germany or France. Aren’t meta-search engines like dogpile better suited for the purpose? Yeah. this tool is going to remain on my bookmarks toolbar this week :) . Otherwise I don’t see a future for it. Doesn’t handle “-character. Can’t search for phrases. >Doesn’t handle “-character. Can’t search for phrases. I can verify that it gives no search results when you use the quote character. So I typed in the phrase I commonly use to test all search engines, but without the quote characters. It found the phrase results perfectly in each engine. I didn’t test for double quote searches, like “whitecats” “black dogs”. And I didn’t bother to try a Boolean search. But I’m satisfied with the results for comparison purposes. myyahogle.com it simultenously displays the search results of google + bing. it works try it! Google Chrome is very fast.